Hey GEEX TrackMania 2 Canyon contestants! I need to let you know of an update I had to make to the official track pack for the GEEX prelims on 07 October. The atphavoc map called "Spare Parts 2" has a Push Forward (PF) start and we had a lot of contestants practicing on the Prelims server that the PF wasn't working correctly on each start/respawn. I discussed this with atphavoc and he provided me an alternate track that doesn't have a PF start. We ran it on the server tonight and have decided to use it instead of Spare Parts 2. The track is called "Cradle of Speed" and I have made the change in the official prelims pack. The GEEX Prelims server also reflects the update. 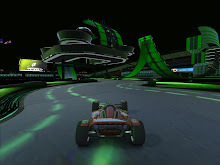 Download the GEEX 2011 TrackMania 2 Canyon Tournament official prelims map pack.